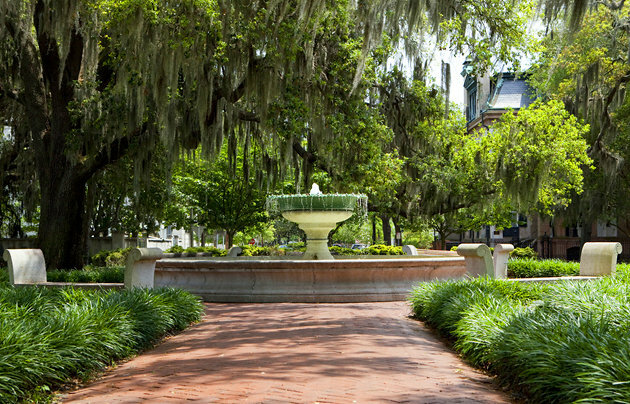 This is a tour of the Savannah’s historic district, focused on running through the 22 squares, each a little green oasis shaded by lush magnolias and filled with Greek fountains, obelisks, and statues. This run will also take you by most of Savannah’s historic landmarks. We’ve laid out a run that goes through each square east-west, then heading south along one of the streets to hit the next set of squares, which you’ll hit every 40 seconds or so. Eventually, you’ll reach Forsyth Park. For the full 6 mile run, take the 1/2 mile through the park and back, and run back on Bull St. or any other south to north street of your choice, for variety. It’s about 1 mile from Forsyth Park to the river. To shorten the run, you can save Forsyth Park for another time. We suggest picking up a historic Savannah walking map, which will be a nice guide to each square, and the landmarks along the way. Also, go early to avoid the crowds. Add-Ons: A jaunt along River St., which runs 1.2 miles between the Marriott hotel at the intersection of East Bay St., west to the Talmadge Memorial Bridge. At Forsyth Park, many lovely residential streets nearby. Franklin Square, W. Congress St.